I still think Jango went down quickly by Mace Windu, not so much to show how weak Jango was, but to show how much of a baddy Mace Windu was supposed to be. I mean, Jango fought Obi-Wan to a standstill, the guy he kills on the balcony was a member of the Jedi Council (aren't they all suppose to be the best of the Jedi). Even in Open Seasons, after Jango realized how many of his men the Jedi have killed, Jango kills several of the Jedi "with his bare hands" before he is subdued. Now, here comes Mace Windu who takes out Jango, seemingly effortlessly. But to a Jedi of that skill, it probably should have been effortless. However, I do think they had Jango depend on his jetpack too much. He obviously wouldn't have bit the dust so quickly, had his jetpack fired, when he ignited it and all it did was spark and do nothing. A much more drawn out fight between the two of them would have been more believable. 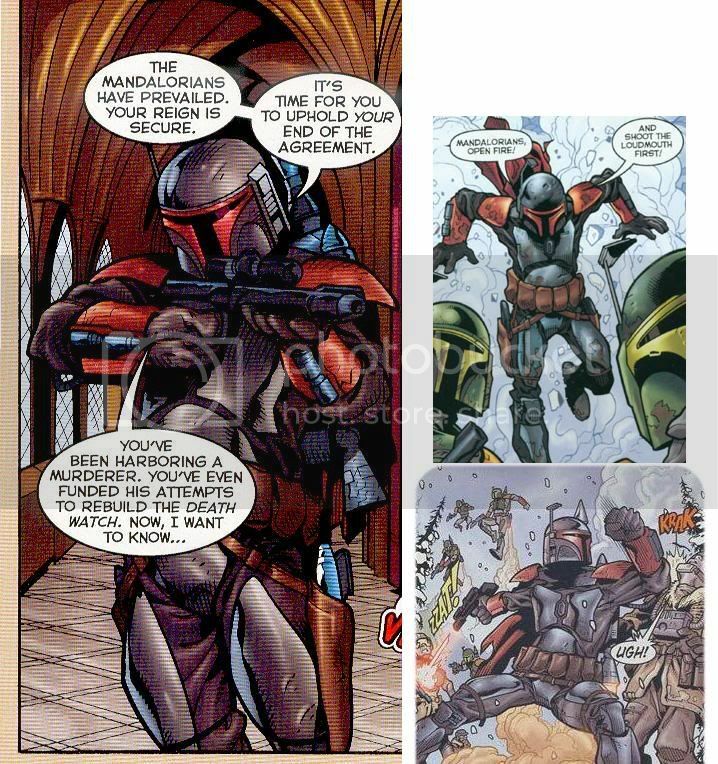 I know I put this in another thread before, but here's the different pics of Jango's armor through the Open Seasons comics. His first set looks very much like Boba's. And his second set looks just like Jaster Mereel's, but without the symbols on it. I will concede that JANGO had functional armor, he has all the same stuff as BOBA on the games and all, minus the rocket launcher, which is a fundamental difference. BOBA is ready for a ship encounter, now JANGO did have the wrist rockets. 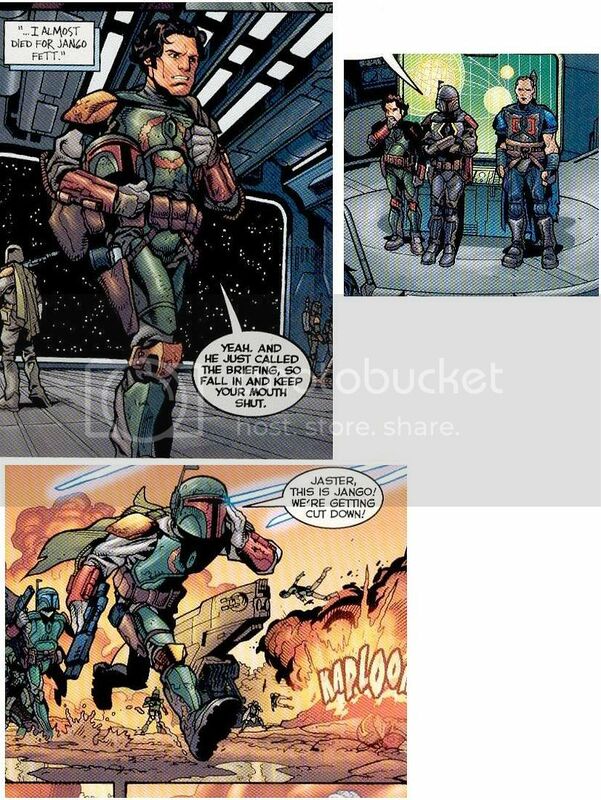 Jango had a rocket launching jetpack just like Boba. He fires it at Obi-Wan during their fight on the landing platform on Kamino in AotC. As far as my preference goes I like the way Jango's armor is bulkier and looks more like its made for actual combat. Most Mandalorian Shock Trooper armor(like Boba's) have a liner shirt with a micro energy field projector and two layers of ceramic plates under the torso armor to increase durability and protection, so maybe the pants have the same thing or something similar. It would seem unlikely that Boba or Jango or any Mando would leave their legs with so little protection. Gah this makes me want the comics all the more! Jango's armour is silver purely because they made it and before they could paint it, George came into the room to look at the props and spotting the silver armour liked it and kept it that way. As to Jango's head in the helmet, if you look closely following the scene in which he's decapitated, you can see the helmet fly through the air and the shadow of Jango's head flying out from it. Do you know what color they were going to paint it? Maybe they were going to paint it to be green like Boba's. Now I also have to watch the arena fight more carefully to see this thing with the helm. Im fascinated and grossed out at the same time. Just watched the scene on YouTube, there is a head shaped/sized shadow. Interesting. Ah Man I allready said that in another post. Or a maby you put it up first. Piont is we both noticed it. Purple? Looks blue to me. Hey At least you have one. I'd love to have a Jango or Boba action figure. You dont ee that is so sad, i have over o dozen of each (not to brag) But on another note, in the books boba re-paints and cleans his armor all the time. Maybe he thinks the chips and dents give him an edge of sorts. But yeah, I think Boba is cooler. I don't know why exactly. Theres just something about him I find more appealing. I agree that Boba is the better and more interesting Fett *though not by much in my book,* but I can't get over the thought that Both of them TOGETHER would be even BETTER! Boba Fett gets back to his feet. Looking across at the other hover skiff, he sees Luke deflecting bolts from the passengers. Boba takes aim with his wrist laser and fires, missing just a little high. Behind him, Solo hears Chewie say Boba is right behind him. "Boba Fett? Boba Fett?? Where..."
Before he can swing his stick/whatever backward, Solo is sniped in the head by Jango from the deck of the sail barge. Boba, seeing with his 360 degree vision what almost happened, gives 'ol Dad a quick wave/salute, takes aim again with his missile launcher, and blows up Luke's hover skiff, sending LUKE screaming into the Sarlacc like a girl. That would end the saga,... but it would be so cool, older jango SHWEEEEEEEET! Ahhhh! I saw a Jodo Kast action figure at Wal-mart. and I DIDN'T HAVE ANY MONEY! Why the winks? That's a perfectly happy ending I thought.